A nuclear submarine is a ship powered by atomic energy that travels primarily under-water, but also on the surface of the ocean. Previously, conventional submarines used diesel engines that required air for moving on the surface of the water, and battery-powered electric motors for moving beneath it. The limited lifetime of electric batteries meant that even the most advanced conventional submarine could only remained submerged for a few days at slow speed, and only a few hours at top speed. On the other hand, nuclear submarines can remain under-water for several months. This ability, combined with advanced weapons technology, makes nuclear submarines one of the most useful warships ever built. The first serious proposal for a ship designed to travel underwater was made by the English mathematician William Bourne in 1578. Bourne suggested using two hulls, one of wood and one of leather, but this device was never actually built. The first working submarine was built by the Dutch inventor Cornelis Drebbel in 1620. Using a design similar to the one proposed by Bourne, this device was propelled beneath the surface of the Thames River by eight wooden oars. During the early eighteenth century, several small submarines were built using similar designs. In 1747, an unknown inventor suggested attaching goatskin bags to a submarine. Filling the bags with water would lower the submarine, and ejecting water from the bags would raise it. The same basic concept is used in modern ballast tanks. The submarine was first used in warfare during the American Revolution. The Turtle, designed by Yale student David Bushnell, attempted to attach an explosive to a British warship, but failed to penetrate the copper sheathing on the ship's hull. In 1801, the American inventor Robert Fulton built the Nautilus, a submarine constructed of copper sheets over iron ribs. The Nautilus, which could carry a crew of four, succeeded in sinking ships in tests, but was rejected by both France and England. Fulton was working on a steam-powered submarine that could carry a crew of one hundred when he died in 1815. During the American Civil War, Horace L. Hunley financed the building of submarines for the Confederacy. The third of these vessels, the H. L. Hunley, attacked and sank the Union ship Housatonic on February 17, 1864, but was itself destroyed in the resulting explosion. During the late nineteenth century, numerous submarines were built in the United States and Europe. Methods of moving the submarine evolved from hand-operated propellers to steam engines, gasoline engines, and electric motors. Submarines using diesel engines for surface travel and electric batteries for underwater travel were used successfully in World War I and II. The development of nuclear power after World War II revolutionized submarine technology. Under the direction of Hyman Rickover, an engineer and officer in the U.S. Navy, American inventors Ross Gunn and Philip Abelson designed the Nautilus, the first nuclear submarine that was launched in 1954. By 1959, some nuclear submarines, known as strategic submarines, were used to carry missiles with nuclear warheads. Other nuclear submarines, known as attack submarines, were designed to sink enemy ships and submarines. Strategic submarines and attack submarines became a vital part of naval forces worldwide. The first use of a nuclear submarine in active combat took place in 1982, when the British attack submarine Conqueror sank the Argentine ship General Belgrano during the conflict over the Falkland Islands. 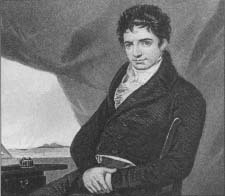 Robert Fulton, best known for his work in steamboat technology, was born in Little Britain, Pennsylvania, in 1765. As a child, Fulton enjoyed building mechanical devices. His interest turned to art as he matured, and although he managed to support himself through his sales of portraits and technical drawings, the general response his work received was disappointing and convinced him to concentrate on his engineering skills. In 1797 while researching canals in Paris, France, Robert Fulton became fascinated with the notion of a "plunging boat," or submarine, and began designing one based on the ideas of American inventor David Bushnell. Fulton approached the French government, then at war with England, with the suggestion that his submarine could be used to place powder mines on the bottom of British warships. After some persuasion, the French agreed to fund the development of the boats and, in 1800, Fulton launched the first submarine, the Nautilus, at Rouen. The 24.5 ft (7.5 m) long, oval-shaped vessel sailed above the water like a normal ship, but the mast and sail could be laid flat against the deck when the craft was submerged to a depth of 25 ft (7.6 m) by filling its hollow metal keel with water. Fulton's plan was to hammer a spike from the metal conning tower into the bottom of a targeted ship. A time-released mine attached to the spike was designed to explode once the submarine was out of range. Although the system worked in the trials, British warships were much faster than the sloop used in the experiments and thus managed to elude the slower submarine. The French stopped funding the project after the failed battle attempt, but the British, who considered the technology promising, brought Fulton over to their side. Unfortunately, once again the submarine worked well in tests, but proved unsatisfactory on practical situations. After its failure in the Battle of Trafalgar (1805), the British too abandoned the project. After these experiences, the undaunted Fulton turned to a new area of exploration—steam. Through his contacts in Paris, Fulton met Robert Livingston (1746-1813), the American foreign minister to France who also owned a 20-year monopoly on steam navigation in New York State. In 1802, the two decided to form a business partnership. The following year, they launched a steamboat on the Seine river that was based on the design of fellow American John Fitch. Fulton returned to New York later in 1803 to continue developing his designs. After four years of work, Fulton launched the Clermont, a steam-powered vessel with a speed of nearly five miles per hour. The partnership between Fulton and Livingston thrived, and Fulton had at last achieved a recognized success. Fulton's persistence and belief in his ideas helped steam-boats become a major source of transportation on the rivers in the United States, and resulted in a significant reduction of domestic shipping costs. The main material used in manufacturing a nuclear submarine is steel. Steel is used to make the inner hull that contains the crew and all the inner workings of the submarine, and the outer hull. Between the two hulls are the ballast tanks, which take in water to make the submarine sink and eject water to make the submarine rise. In addition to steel, various parts of a nuclear submarine are made from other metals, such as copper, aluminum, and brass. Other materials used to manufacture the thousands of components which make up a fully equipped nuclear submarine include glass and plastic. Electronic equipment includes semiconductors such as silicon and germanium. The nuclear reactor that powers the submarine depends on uranium or some other radioactive element as a source of energy. 1 Because nuclear submarines are only manufactured for military use, the decision to build them is made by a national government. In the United States, the Undersea Warfare Division of the Navy is responsible for requesting that a group of submarines, known as a flight, be manufactured. 3 Funding for nuclear submarines is included in the defense budget presented by the President to Congress. If approved, the manufacturing process begins. The nuclear reactor is supplied by the government's Naval Reactor project. The methods used to manufacture these nuclear reactors are closely guarded and disclosure would be considered a breech of national security. 4 Steel plates, approximately 2-3 in (5.1-7.6 cm) thick, are obtained from steel manufacturers. These plates are cut to the proper size with acetylene torches. 5 The cut steel plates are moved between large metal rollers under tons of pressure. The rollers, each about 28 in (71.1 cm) in diameter and about 15 ft (4.6 m) long, are set up so that one roller rests on two others. As the steel plate moves under the top roller and over the two bottom rollers it is bent into a curve. The plate is rolled back and forth until the desired curvature is obtained. 6 The curved steel plates are placed around a wooden template that outlines the shape of the hull. They are then welded together by hand to form a section of the hull. The section is lifted by a crane and placed next to another section. The two sections are rolled slowly under an automatic welder, which seals them together. The rotating sections move beneath the welder several times, resulting in an extremely strong seam. The manufacture of a submarine is highly complex and utilizes both manual and automated processes. Large sheets of steel are rolled and welded into the shape of the inner and outer hulls. Scaffolding is erected during manufacture so accessibility remains unencumbered. Every aspect of manufacture is checked by inspection and quality control measures. For example, welded steel components are inspected with x rays. Pipes are filled with helium in order to check for leaks. As a result, the Naval Reactors program is considered to have the best safety record of any nuclear power program. bars of steel until they are soft enough to bend. Automatic hammers strike the ends of the bar, producing a curve matching the hull. 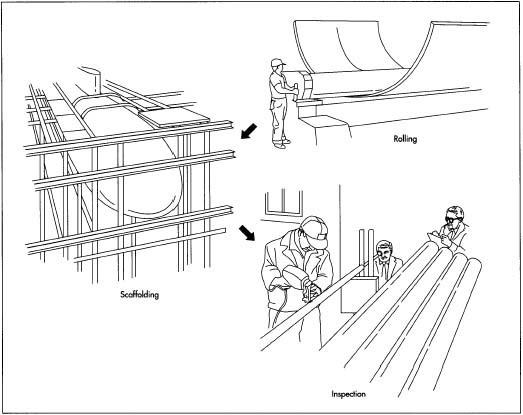 8 Welding several sections together produces an inner hull. The same process is repeated to form an outer hull. The inner hull is welded to steel ribs that are then welded to the outer hull. The steel ribs separate the two hulls, allowing space for the ballast tanks that control the depth of the submarine. The outer hull only extends as far as the bottom and sides of the inner hull, allowing the submarine to remain upright. 9 Meanwhile, steel plates are welded in place inside the inner hull in order to divide the submarine into several watertight compartments. Steel decks and bulktheads are also welded in place. Exterior welding seams are polished by high-speed grinding wheels, making them smooth. Not only does this improve the surface for painting, but it also provides the submarine with a streamlined surface that experiences little friction during travel. The hull is then painted with layers of protective coatings. 10 External components such as rudders and propellers are made using various metalworking techniques. One important method used for many metal components is sand casting. This process involves making a wood or plastic model of the desired part. The model is then surrounded by tightly packed, hardened sand held in a mold. The halves of the mold are separated, allowing the model to be removed. The shape of the desired part remains as a cavity in the hardened sand. Molten metal is poured into the cavity and allowed to cool, resulting in the desired part. 11 The hull is surrounded by scaffolding, allowing workers to reach all parts of it. The external components are welded or otherwise attached. Certain components, such as sonar equipment, are attached to the hull then covered with smooth sheets of steel in order to reduce friction during underwater travel. 12 Large equipment is placed within the inner hull as it is being built. Smaller equipment is brought into the inner hull after it is completed. The submarine is launched before much of the interior equipment is installed. After the launching ceremony, the submarine is towed into a fitting-out dock, where work on the interior continues. Vital components such as periscopes, snorkels, engines, and electronic equipment are installed. Equipment for the comfort of the crew, such as refrigerators, electric stoves, air conditioners, and washing machines are also installed at this time. 13 The nuclear reactor begins operating as the submarine begins its first sea trials. The crew is trained during an Atlantic Ocean cruise. Weapons are launched and tested, often in waters off Andros Island in the Bahamas. The submarine is officially commissioned in a ceremony which changes its designation from "Precommissioning Unit" (PCU) to "United States Ship" (USS). The submarine then undergoes a shakedown cruise before entering active service. The vital role it plays in national defense, the fact that the lives of its crew depend on its proper functioning, and the dangers inherent in its nuclear reactor ensure that quality control is more important for a nuclear submarine than for almost any other manufactured product. Before construction begins, the materials which will be used to build various components are inspected for any structural flaws. Previously when a new design for a nuclear submarine was proposed, a scale model was built to see if any improvements could be made. Scale drawings of the new design were made, then expanded into full-size paper patterns that allowed small details to be studied closely. A full-sized mockup of the interior was made in order to give builders a chance to adjust the location of components in order to save space or make them more readily accessible. Presently, design modeling, modification, and simulation are all enhanced by the use of computers. When the steel plates are cut and rolled to form the hull, they are inspected to ensure that all dimensions are accurate to within one sixteenth of an inch (0.16 cm); smaller parts may need to be accurate to within one ten-thousandth of an inch (0.00025 cm) or less. Proper welding of all steel components is inspected with x rays. Pipes are inspected by filling them with helium and checking for leaks. Every instrument is tested to ensure it works properly. In particular, the nuclear reactor undergoes stringent tests to ensure that it is safe. As a result of these precautions, the Naval Reactors program is considered to have the best safety record of any nuclear power program. After the submarine is commissioned, it undergoes a shakedown cruise to see how it would operate in wartime conditions. The speed and maneuverability of the submarine is tested to ensure that it meets the necessary requirements. The greatest concern dealing with wastes produced by nuclear submarines involves the radioactive waste produced by nuclear reactors. Although the waste produced by a nuclear submarine is much less than that produced by a larger nuclear power plant, similar problems of disposal exist. The Naval Reactors program has an excellent record of safely storing radioactive wastes. Some environmentalists, however, have expressed concern about the possibility of radioactive material being released if a nuclear submarine is sunk by accident or during military operations. Nuclear submarines are expected to remain a vital part of naval defense systems for many years to come. Future designs will feature new ways to improve the speed and depth capabilities of nuclear submarines. Research will also lead to an improved ability to detect enemy ships while remaining undetected. With the demise of the Soviet Union, leading to reduced defense budgets, the U.S. Navy faces the challenge of reducing the cost of nuclear submarines while retaining their effectiveness. With this goal in mind, the New Attack Submarine program was devised in the 1990s, with the goal of replacing large and expensive Seawolf attack submarines with smaller, less expensive, yet equally effective nuclear submarines. Clancy, Tom. Submarine: A Guided Tour Inside a Nuclear Warship. Berkley, 1993. George, Glenn R., and Lisa Megargle George. "The Naval Reactor Program: From Nautilus to the Millennium." Nuclear News (October 1998): 26-33. Newman, Richard J. "Breaking the Surface." U. S. News and World Report (April 6, 1998): 28-31. Wilson, Jim. "Run Silent, Run Deep." Popular Mechanics (January 1998): 62-66. "Nuclear Submarines of the World." January 24, 1998. http://www.shima.demon.co.uk/sublist.htm/ . You could have used actual pictures instead of simple drawings for your illustrations.